The Annapurna Conservation Area (ACA) is the largest protected area of Nepal, embracing a spectacular diversity of flora and fauna and a wide range of landscapes ranges from subtropical jungle to lofty mountains and high, arid plateaus. Since Nepal was first opened to foreign visitors in the 1950s, an ever-increasing number of tourist have journeyed here to experience some of the most impressive scenery in the world. 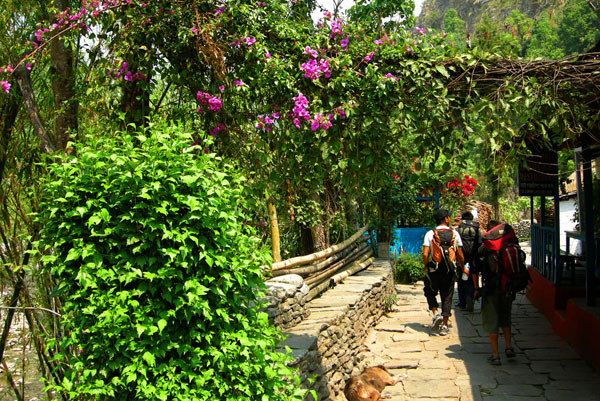 The Annapurna region is the most popular trekking area in Nepal. Home to one of the world`s tallest peaks – Annapurna I 8091m – and the sacred mountain of Maccapuchhre (Fishtail) 6993m. Annapurna also boasts the world`s deepest valley, the Kali Gandaki Valley, numerous impressive waterfalls and glaciers and the stunning Trans-Himalayan zone of Upper Mustang. Trekking in Annapurna, particularly the Annapurna Circuit & Annapurna Sanctuary, involves walking for an extended time over rugged, steep trail in remote areas, while being exposed to the elements, especially when crossing high passes of over 5000m.